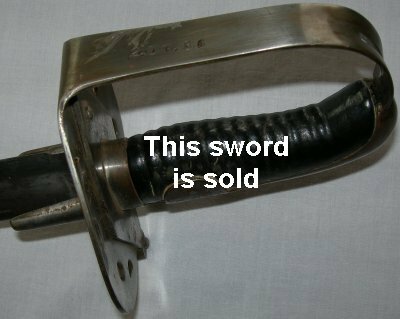 Almost perfect original condition 1796 Pattern Heavy Cavalry Trooper’s Sword with scabbard. This is one of the most scarce and sought after British cavalry swords there is. Most of the small number you occasionally find have undergone field modifications such as having the langets cut off or part of the hand guard removed (to prevent fraying to uniforms). Other swords have had their blade points sharpened to spear points. This almost perfect specimen is in 100% original condition and therefore is the cream of cream of British cavalry swords for the serious collector. Marked on the knuckeguard to trooper 86 of the 2nd Regiment of the Dragoon Guards with a blade serial number of 0374 on the spine; the blade is 88 cm long. Further pictures available upon request.